Gut health MS. Gut Health is huge when it comes to multiple sclerosis (MS) and autoimmune disease and there is a lot that you can do to keep it healthy both by what you put in your mind and in your body. In this month’s series, Eva Clark talks about how our emotions influence our gut through our molecules of emotion called neuropeptides. One of the impactful emotions that can ‘eat’ at us for months and even years is regret. In this month’s Creating Health Series, she takes us through an exercise to release regret. Steve Andreas, neurolinguistic programming (NLP) trainer, defines regret as “an unpleasant feeling resulting form thinking about some action or inaction that had a negative impact on you”. So regret holds a few key factors. First, there was a choice to make – act on something or not act on something. Secondly, the choice we did follow, sometimes knowingly (deciding to move from your home town) and sometimes not (forgetting to check your bank account), has an undesired affect in our lives. And that undesired effect has some sort of consequences that violate our values (such as family time), outcomes (less retirement pay than we need), or our goals (to be health and fit). And because of that consequence, you feel bad. That is regret. And we compound the feeling by reminding ourself of the consequences, talking negatively to ourselves that ‘we should have known better’ and ‘if I would have…’ (kept exercising, my MS would’nt be so bad now for example) and comparing ourselves to others that we feel succeeded in this area of life. It can keep us from sleeping well, being pep in our step and grateful, and can significantly upset our stomachs. But, when we become aware of how our choice created an undesired outcome, we, once again have a choice. Do we want to keep attending to the unpleasant consequences and hypothetical benefits of the other choice? And I call it hypnothetical because we imagine all the great results of the other outcome but we can’t be 100% sure that is what would happen if we had chosen differently. Life has many turns! Or we can chose to balance the choice we made, weighing in all the results and consequences evenly and then moving forward. What benefits did my choice give me? What became available because of the choice I made? In this area, include time constraints. More time at the gym or at the pool or cooking wholesome meals every night means less time somewhere else. With your kids or with friends, etc. Or living away from family might have given you business experience and exposure your home time would not have. Also include here what you learned through this choice. Sometimes learning what not to do is a very important lesson. This learning allows us to have more awareness of what is important to us and allows us to make better choices now and in the future. Unpleasant consequences of the other choice we didn’t take. Including time constraints as well as opportunities that we wouldn’t have had if we picked the other choice. Once you can see all 4 areas together, we can get a better picture of the choice and its consequences as well as opportunities. Then we can assess what we would like to do now and in the future from a place of awareness and knowing what is important to us and worth it to pursue. 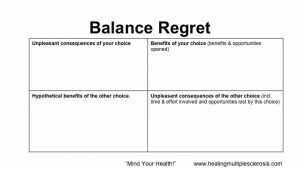 You can download the chart below witht the 4 quadrants to work through your regrets and come to a better understanding and choice about what to do now. As she explains in the presentation, we can’t avoid regret, but we can manage it. First, we must understand that having choice will always mean that, many times, it doesn’t go as we would have liked it to. But its better to live in a country that allows us to chose where we live and work and to be responsible for our own lives and decisions, our own choices as much as we can. Second, we need to remember that, the choice we made was what we thought was the best decision at the moment. We know now things we didn’t know then (about our values and priorities, the economy and stock market, what we’d be needing in the future, the state and needs of our health, etc). We need to learn and then move forward. Will I choose differently now? Oh yeah! Gut Health is one of the central factors to health and disease, especially autoimmune diseases such as MS. Your “gut” includes the small and large intestines. It is like a 25 feet long tube that spread out is 3000 square feet. There are 100 trillion microbes in your gut, 10x’s the number of cells we have in our body. Microbiomes help fight pathogens and keeps our immune system in balance. Most of our immune system resides in our gut. In fact, about 75% of your immune system is in the lining of your gut. This linen, only one cell thick, is the interface between the inside world and the outside word. So maintaining the integrity of your gut helps you maintain the integrity of your immune system. As MS is an autoimmune condition, to help our immune system we need to focus on the health of the gut. Apart from its support of the immune system, the microbiome digests dietary fiber. If we don’t get enough fiber, the microbes will start eating the linen of out gut. That is how important adequate fiber intake is! Our ancestors ate many many times more fiber than we do with our modern diets. They did not have autoimmune conditions. Thus returning to some of their food choices and way of eating would benefit our gut. If our microbiome is not balanced, our gut is imbalanced. In 2011, Alessio Fasano, a reseracher in Harvard University discovered the third factor in the onset and progression of autoimmune disease. Up to 10% of the cause of autoimmune disorders can be considered genetics. The second factor is enviromental (food, infection, hormone imbalance, toxins, and stress). Alessio introduced the third factor – leaky gut. The scientific name for leaky gut is hiper intestinal permeability. Any number of things can cause the linen of our gut to become inflamed and then leaky. Heavy loads of inflamation will not allow us to take in the nutrients we need and that leads to an imbalanced microbiomes. Gluten, for example causes some degree of leaky gut. A person that is healthy and not suceptibel to autoimmune disorder might not have any troubles with this. Someone with MS or other autoimmune disorders must avoid anything that can cause leaky gut. Anything that causes linen tear or leaky gut will trigger the immune system to attack anything that seems similar to the culprit of the leak thus aggravating even more the linen as well as anything in the body that mimics molecularly that culprit. Myeline sheaths of our nervous system can look suspiciously like gluten. 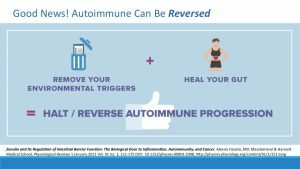 Thus, according to Alessio Fasano, the way to halt or reverse MS and other autoimmune disorders is to find and remove your environmental triggers and heal your gut. The implications are well worth making the effort to discover them! What Harms Your Gut and How to Heal? The road to health is paved with good intestines.” Sherry Rogers, M.D. Gluten might not be what effects is harming your gut the most. You must dig deep and find out what is harming our gut. Here is a short list of the many ways we harm our gut. 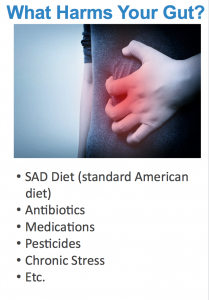 All of these, by themselves can cause leaky gut, including stress. Be mindful of what you put into your body and mind. Even if we have decades or a life time living this way, we can still flip it around and heal our gut. First you must take out what harms your gut. Then, and only then, begin to add what helps your gut heal. 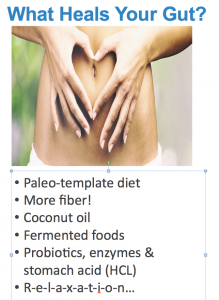 Paleo template diet seems to have the most research and acceptance in the Functional Medicine community (doing what our accestors did) but there is no one-size-fits-all. If you enjoyed this presentation on Gut Health MS and would like to receive these videos on healing multiple sclerosis as they are published directly in your inbox each month, please sign up for our newsletter. Don’t be left behind. There is help. This series is being recorded at the National MS Society Self-Help MS Group in Santa Cruz, CA. The National MS Society respects the rights of people with MS to obtain any and all information they want related to MS, including information on wellness, medical treatments or complementary therapies, and products or services. The information presented at these meeting does not necessarily reflect the views or official position of the Society, nor carry the endorsement or support of the NMSS.